While many Canadian snowbirds have been living the RV lifestyle for quite some time, a recent trend has seen a significant increase in snowbirds choosing RVs over rental accommodations or vacation home ownership for their winters away from Canada. The trend has been driven largely by Baby Boomers, who are retiring in increasing numbers. These Boomers are re-inventing retirement by turning away from traditional winter vacation accommodations in favour of state of the art homes on wheels. Boomers and the “mature” category make up about 40% of the RV and campers’ market, according to Devenish. To help other Canadians snowbirds considering the RV lifestyle, Snowbird Advisor interviewed a panel of experienced snowbird RV owners to share their input. According to our panelists, the carefree lifestyle along with the ability to travel when and where you want without much planning was the main appeal. Some had experienced it earlier in life when their kids were young, while others only started at retirement, or just before retirement. 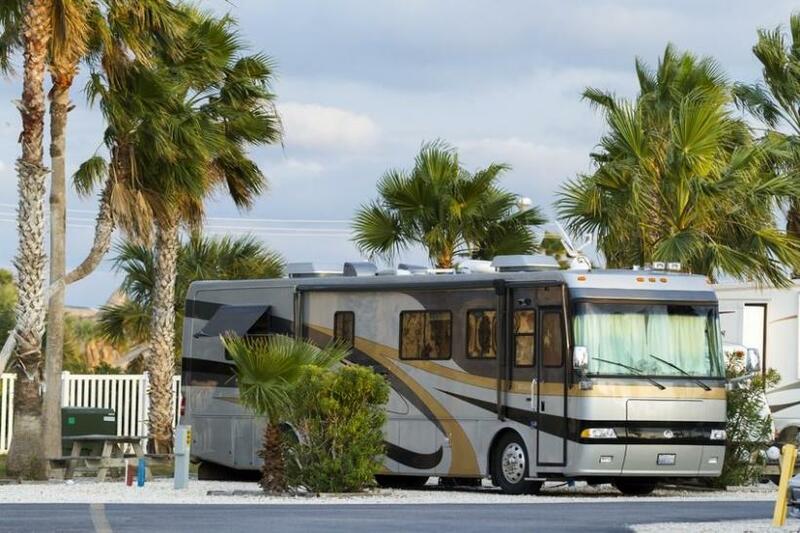 What types of RVs are most popular for snowbirds? RVs vary in size and type but simply put, they are either a motorhome or a travel trailer, with amenities that depend on size and cost. The big difference is that motorhomes are vehicle that you actually drive, while travel trailers are designed to be towed behind your family car, SUV, minivan or pickup truck. According to GoRVing, today’s RV travel trailers are the most popular, as they’re the most spacious and allow you to stay in comfort and style while RV camping. Once you arrive at your destination, you simply unhitch the trailer and your vehicle is free to make trips around town or to local attractions. This popular RV type comes in various sizes and configurations, with the largest being spacious “fifth-wheel” trailers that even have split level floor-plans inside. Should you rent an RV before you buy? Although it can be expensive, it is not a bad idea to try renting an RV before you leap into ownership. According to GoRVing, typical RV rentals include motorhomes, but you can also choose to rent travel trailers if you have the proper vehicle to tow with. RV rental costs depend on what type of RV you want to rent, and the overall size you require for your sleeping and living accommodations. An average 25-foot class C motorhome, the most popular rented model, will cost about $1,000-$1,200/week. Travel trailers will typically cost about $500/week. Depending on features and the season, prices may vary, and you may need to also rent a pickup truck. If you rent, there are no costs for maintenance or registration. However, there may be additional charges for a TV and DVD Player, extra mileage, or a winterizing fee for wintertime RVing. There are many companies that rent RVs. You may also want to check out websites like RVezy, Outdoorsy and Airbnb who pair owners and renters online. Just like automobiles, new RVs depreciate considerably once they are taken off the lot. There are many bargains to be had by buying a used RV, but of course, you will want to check its condition and maintenance history carefully. Also, most RVs are manufactured in the U.S., so with the currency exchange, the new units are more expensive at the moment, advised one of our panelists. “The biggest advantage to buying a pre-owned RV is price. You’re going to get a lot more bang for your buck if you take this route. However, a new RV will feature the latest and greatest in design, no one else will have ever lived in your RV and the mileage won’t be racked up,” says Chris Mahoney, President of GoRVing Canada. How much does an RV cost in Canada? Anyone even contemplating this lifestyle should attend at least one RV show, according to Devenish. You will find many experts there to give you advice, as well as all different models of motorhomes and trailers. There are also lots of other exhibitors such as camp grounds, RV parks, insurance vendors, etc. Most snowbird buyers would be looking at a range between $75,000 to $500,000. The cost can be even higher for the most luxurious RVs. What are the other costs associated with the RV lifestyle? There are a number of additional costs that you must factor in when considering purchasing an RV. These include fuel, a suitable towing car (if you require it and don’t already own one), insurance, extended warranty and RV park fees. Do you need a special driver’s license for an RV? Needing a special license is one of the largest misconceptions from potential buyers, according to Mahoney. You don’t need a special license to drive a motorhome provided that it is less than 11,000 Kgs (24,250 lbs) and does not have air brakes. The same applies to tow vehicles + RV as long as the combined weight is less than 11,000 Kg. This would effectively allow anyone with a standard Class G Licence to drive the majority of the motor homes and most tow vehicles on the market. However, for the larger units, you will need a special license. It is best to check your Provincial rules covering this. What are the most popular RV winter destinations? Other advice from our experts ….